Janice Duffy stories at Techdirt. 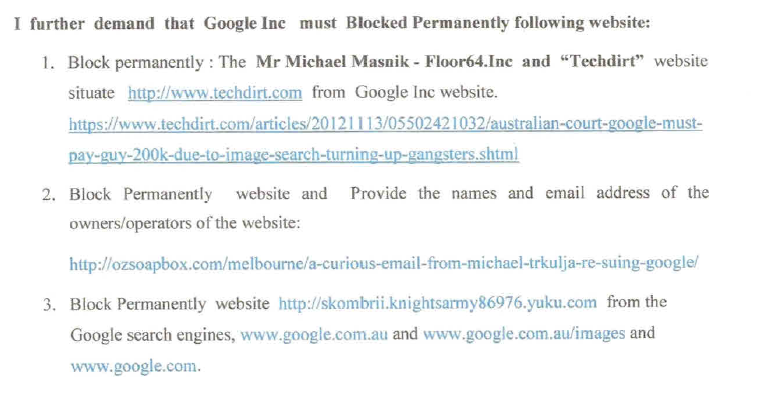 stories filed under: "janice duffy"
Earlier this year, we wrote about a ridiculous lawsuit in Australia where Janice Duffy was suing Google because the search engine returned links to some Ripoff Report pages that Duffy claimed were defamatory. As we noted at the time, this is just a ridiculously misguided lawsuit on multiple levels. It's not targeting whoever wrote the supposedly defamatory material. It's not even targeting who hosted the supposedly defamatory material (which would be problematic enough). It's targeting... Google. Because it finds the supposedly defamatory material. After our story was published, Duffy took to Twitter to yell at us, but refused to provide any further details, other than to complain that we were trying to "humiliate" her. And, I guess she gets the last laugh, because, amazingly, an Australian court has agreed that Google can be held liable for the content and should be considered the "publisher" of the content. Despite Duffy's claims, we're not trying to humiliate her at all. We agree that it cannot be any fun at all to have people post stuff online about you that is not true. But we have very, very serious concerns about the consequences of blaming third parties (or even fourth parties) for the speech of others. It creates tools and incentives for widespread censorship of lots of perfectly factual information, just to deal with the rare cases of defamatory information that can't be removed or countered through other means. And, on top of that, by putting liability on third and fourth parties, it creates a massive chill on innovation and platforms that enable and enhance speech, leading to a serious decrease in innovation. None of that seems to matter to Duffy or the Australian court. The whole ruling is bizarre, repeatedly claiming that because Google links to something, it "publishes" that something. I know they speak a different version of English down under, but this seems like an extreme re-interpretation of the word "publish." On 18 July 2007, Dr Duffy under the username "Janice" posted a report on the Ripoff Report website about Kasamba. She listed names of psychics operating on the Kasamba website who she said were completely wrong about the outcome with someone she had met. The names included Master Z, Fruno and Powerful Visions. She subsequently posted further reports and comments on reports by others on the Ripoff Report website. On 29 July 2007, Dr Duffy created a chat group on yahoo.com under the name “kasambavictims”. Dr Duffy posted the internet address of the chat group on the Ripoff Report website. Dr Duffy communicated over the internet with persons who joined this chat group. Dr Duffy gave evidence that she wrote some of the posts on the Kasamba and Ripoff Reports under usernames other than her own name by reference to events narrated by or in conjunction with some members of this group. On 4 and 15 September 2007, Dr Duffy participated in online email exchanges on Kasamba with SunshiningUponYou. Dr Duffy said that Sun’s January prediction that May would be an amazing month for Jon and herself turned out to be wrong when Jon ditched her for good in May and she had a breakdown. She asked why Sun had made that prediction when the opposite turned out. Sun replied saying that Sun's timeframes were not always right, Jon would in time realise how stupid he had been and Dr Duffy should focus on being well right now. Between 26 and 30 September 2007, Dr Duffy participated in further online email exchanges on Kasamba with SunshiningUponYou. Dr Duffy expressed pessimism and despair about a relationship with Jon and personal pain, anguish, foolishness and depression. Dr Duffy expressed a loss of faith and trust in SunshiningUponYou. Dr Duffy's last post complained that she had spent hundreds of dollars on Sun’s readings, accepted that no relationship with Jon would happen and criticised Sun for making promises Dr Duffy trusted that did not eventuate. In December 2007, Dr Duffy registered with the Kasamba website the username “ozzieb” under the name Oswald Billet. On 18 December 2007, Dr Duffy under the username "ozzieb" posted three online messages on the Kasamba website to SunshiningUponYou saying that his wife’s friend committed suicide on 17 December. Ozzieb posted that Sun was responsible for the death because she told his wife's friend lies that she would be with someone who was using her and who had married someone else. Ozzieb said that he would send Sun's communications with his wife’s friend to the head of Kasamba and the national media. Sun did not respond to the posts. On 19 December 2007, Dr Duffy under the name Oswald Billet sent an email to Kasamba saying that his wife’s friend committed suicide on 17 December and complaining about SunshiningUponYou's conduct leading up to the suicide. On 28 December 2007, Dr Duffy under the username "Friend's Husband" posted a report on the Ripoff Report website about the suicide of his wife's friend and complaining about SunshiningUponYou's conduct leading up to the suicide. It would appear that someone associated with the psychics didn't like all this and then went to Ripoff Report and posted something about Duffy calling her a "psychic stalker." Given all of the above activity, you can see why someone might make that claim -- but really, at this point, debating who's being honest here seems kind of pointless. We're dealing with someone who trusted a psychic and then flipped out after their predictions were not correct. And then the same psychics attacked back. No one comes out of this looking good. I reject Google’s contention that a defendant can only ever be a publisher if the defendant authorises or accepts responsibility for the publication. Such a test is apposite when the defamatory matter is physically attached to the defendant’s property without the defendant’s knowledge or permission, although in that case a better formulation of the test may be whether the defendant has acquiesced in the defamatory matter remaining on the defendant’s property knowing that it will be seen by others. The posited test is not apposite when the defamatory matter is disseminated by the defendant itself and is inconsistent with the innocent dissemination doctrine. The appropriate test remains whether the defendant has participated in the publication. Google was the sole operator and controller of the Google website. 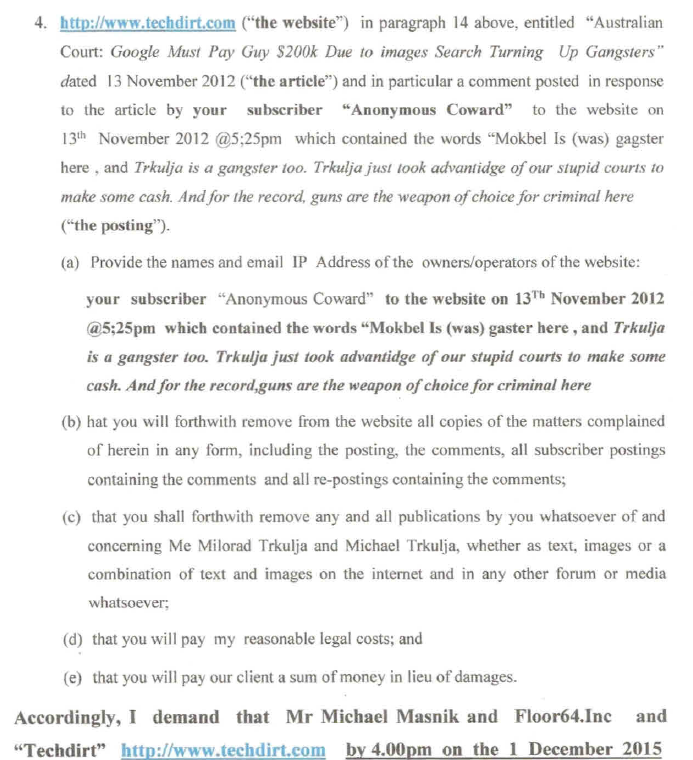 The paragraphs resided on Google’s website. The paragraphs were communicated by Google to the user conducting a search. Google played a critical role in communicating the paragraphs to the user. The physical element of publication is present. Google did not play the passive role of a mere conduit such as an internet service provider who merely provides access to the internet or a telecommunications carrier who merely provides access to the telephone network. Google played an active role in generating the paragraphs and communicating them to the user. The mere fact that the words are programmed to be generated because they appear on third party webpages makes no difference to the physical element. It makes no difference to the physical element whether a person directly composes the words in question or programs a machine which does so as a result of the program. This is dangerous. The idea that a search engine can be held liable for defamation because its algorithm does its job correctly is immensely troubling. Even if you absolutely hate Google, this kind of ruling should worry you. Placing liability on the parties actual responsible is the hallmark of a functioning society. Blaming intermediaries creates all sorts of dangerous consequences on speech and innovation. By providing the hyperlink, Google’s software plays an essential role in the delivery of the content of the webpage to the user upon request. The court rejects basically all of Google's defenses, repeatedly going back to a statement that more or less says "but you published this defamatory information." It's like banging your head against a wall. The court is so sure that Google is responsible and won't be persuaded in any way that that's not the case. There are still some issues in the case that will go to trial, but on the key issue, this ruling is a disaster. Australia has basically just wiped out the idea of intermediary protection from liability -- and if you're an internet service provider in Australia, your legal liability just went way, way up.